Royals Hang On For 3-2 Win To Take Lead In World Series : The Two-Way Following two high-scoring games in Kansas City, Game 3 of the World Series turned into a bit more of a pitchers' duel as the Royals prevailed in San Francisco. Royals first baseman Eric Hosmer celebrates after Giants Hunter Pence grounded out to end Game 3 of the World Series on Friday. Game 3 of the World Series turned into a pitchers'-duel-by-committee on Friday, as eight relievers struck out nine in 7 1/3 innings of shutout baseball for the Giants and Royals. Kansas City entered the seventh inning up 3-2, and that's how the game ended. 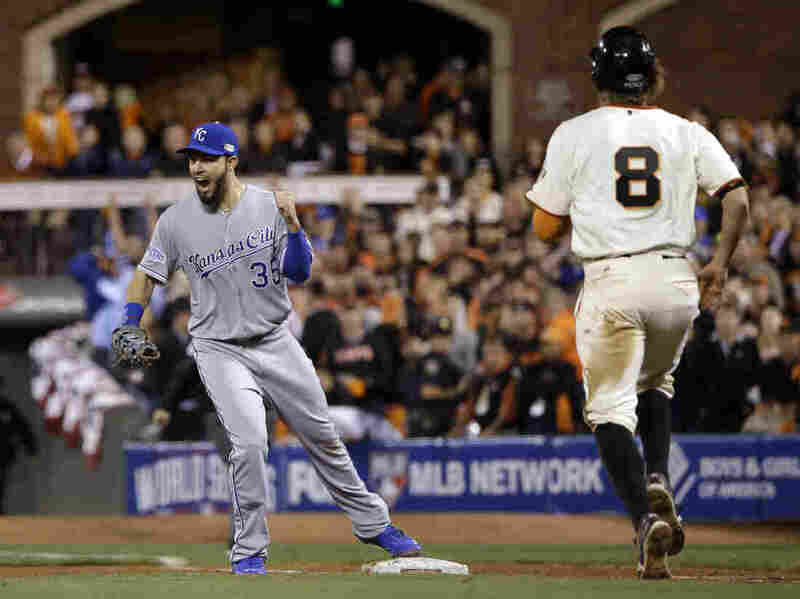 "During the past four weeks, the Royals had reconfigured the calculus of postseason baseball. The opponent now possesses only six innings of offensive scoring opportunity. Otherwise, they must confront the three-inning Cerberus of Herrera, Davis and Holland. "The trio inspires such confidence in [manager Ned] Yost. He now operates with impunity, impervious to criticism, unafraid of mistakes. Until the sixth inning on Friday, he also appeared incapable of pulling the wrong lever. At the start of the game, he rejiggered both his outfield and his lineup. Shifted into right field, Lorenzo Cain responded with two stylish catches. Bumped into the No. 2 spot, Alex Gordon smashed an RBI double in the sixth inning for his first hit of the World Series." Kansas City Royals pitcher Jeremy Guthrie throws Friday during the first inning of Game 3 of baseball's World Series against the San Francisco Giants in San Francisco. A patient at-bat by Eric Hosmer yielded another run for the Royals. 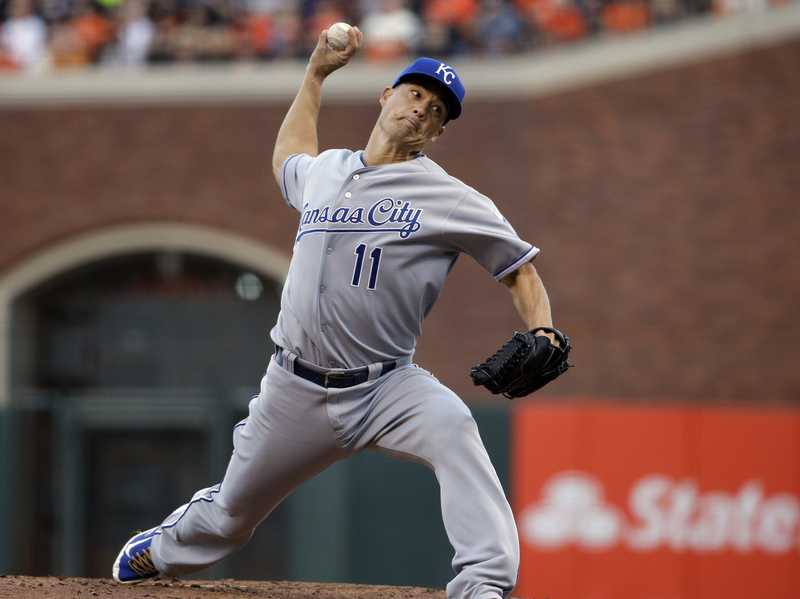 The Giants drove Royals' starter Jeremy Guthrie from the game in the bottom of the sixth and manufactured a couple of runs. But Pablo Sandoval's groundout left San Francisco a run down going into the seventh, when the Royals' dominant chain of relievers entered the game. Kansas City is now 9-0 in the playoffs when leading after six innings. The loss snapped a six-game World Series home win streak for the Giants and ruined the series debut of 16-year veteran pitcher Tim Hudson. Game 4 starts at 8 p.m. ET on Saturday; it's being televised by Fox. MLB.com has a full schedule of games. Giants manager Bruce Bochy told the San Francisco Chronicle that he may give another start to Game 1 pitcher Madison Bumgarner, who held the Royals to three hits in seven innings.